Koi Angelfish are a popular strain or variety of freshwater angelfish in the hobby today. These beauties are mostly the result of selective breeding which is no surprise. Itâ€™s amazing for some 60 years now that wild angelfish have been domesticated or crossed with other strains to create some stunning angelfish to enjoy, like Orange Koi Angelfish for example. Great research on genetics for Pterophyllum scalare has been documented by Dr. Joanne Norton who left us wonderful work on these animals. What makes Angelfish so attractive and sought out is their unique shape, coloration and behavior. They move thru the aquarium with a steady slow grace and itâ€™s hard to imagine that it wasnâ€™t until the late 1920 to 1930â€™s that they were spawned in the USA. 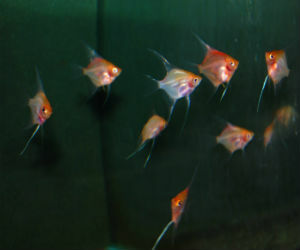 There are three distant species in the Genus of Pterophyllum, P. altum, P. leopoldi and P. scalare which is the most common and readily available captive-bred angels in the hobby. 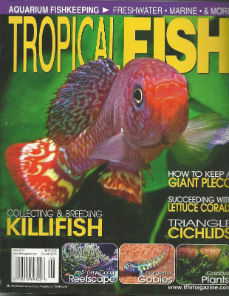 So if you havenâ€™t included Koi Angelfish in your collection yet Order Some Today.